After picking my dad up from the airport, we came home to some delicious tofu burgers that Sofi had made (I helped before I left as well). They were a fusion between our Korean steamed buns and our normal veggie burgers. 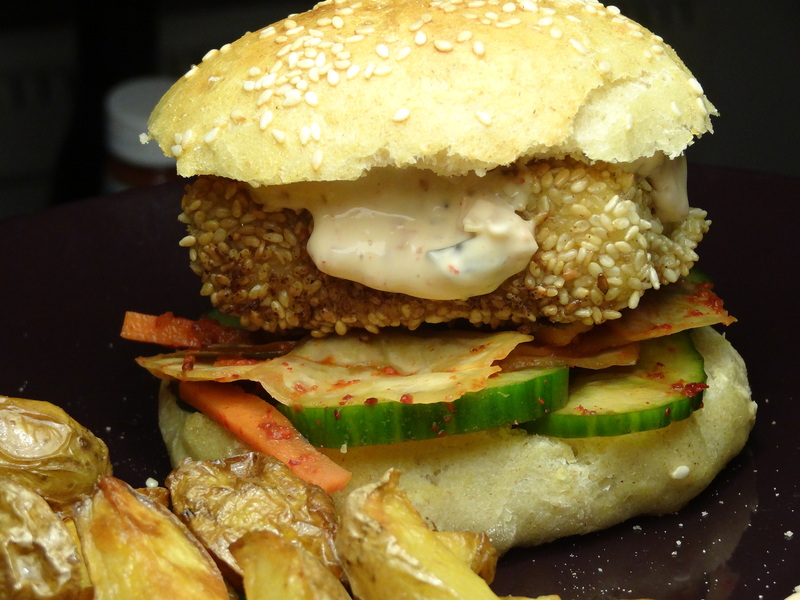 We made them similar to our breaded tofu, but covered them in sesame seeds instead of breadcrumbs, the buns were normal burger buns, and the fillings were various things we use in our steamed buns as well as homemade kimchi. We made the most of Sofi being at home and had her on baking duty so we had something to look forward to once we got back! 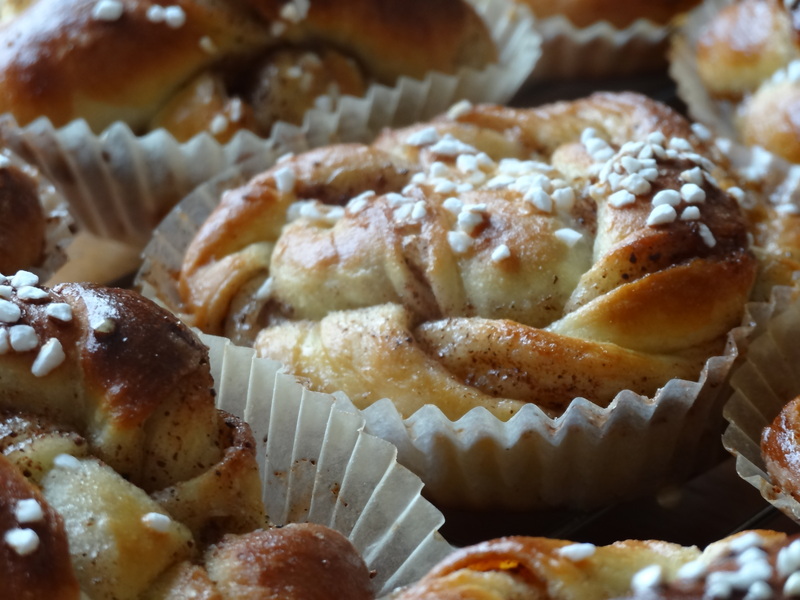 She made some delicious Swedish cinnamon buns, which were exactly what we needed with a nice cup of tea/coffee and glass of milk! We hope you all had a great weekend! Did you get up to anything special? This entry was posted in Thoughts and tagged asian, baking, Blogging, cycling, dessert, dinner, exercise, homemade, kimchi, Korean, Lifestyle, pasta, snack, Sweden, tofu, vegetarian, weekend on 2015-03-03 by activebeans. So, a long wonderful week in the sun has sadly come to an end. We went out for a long ride on Friday. 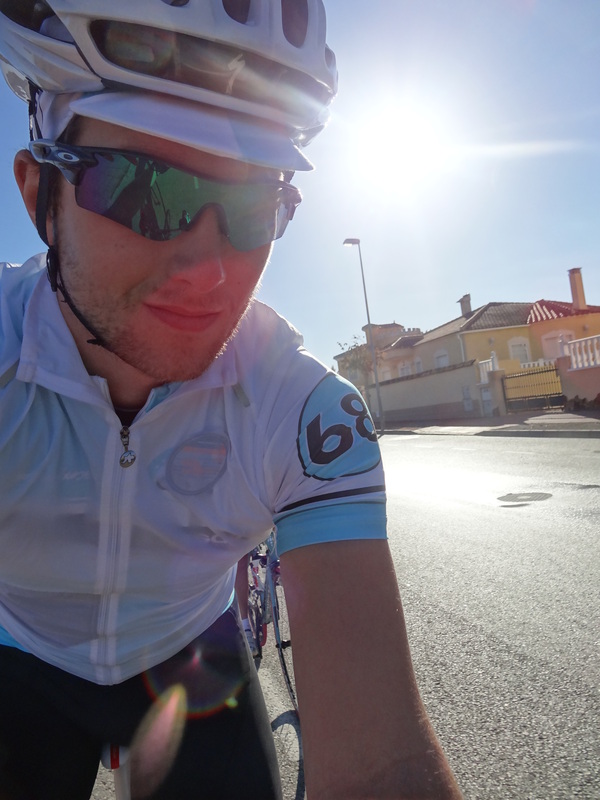 It was the perfect weather, about 25°C in the sunshine and not too much wind. 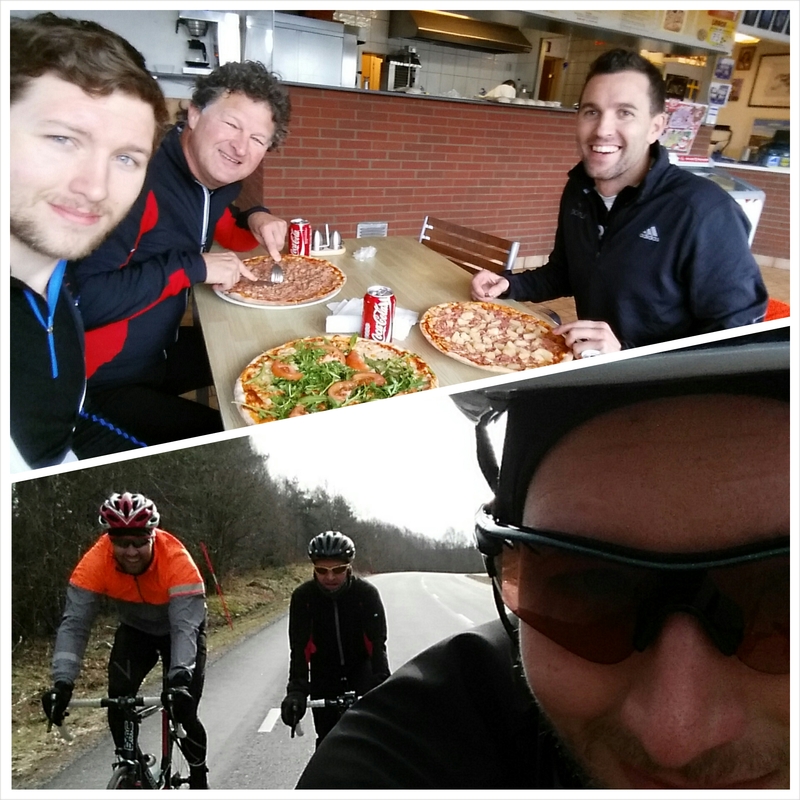 We had planned to do a 100 km ride (and Jason’s ride). 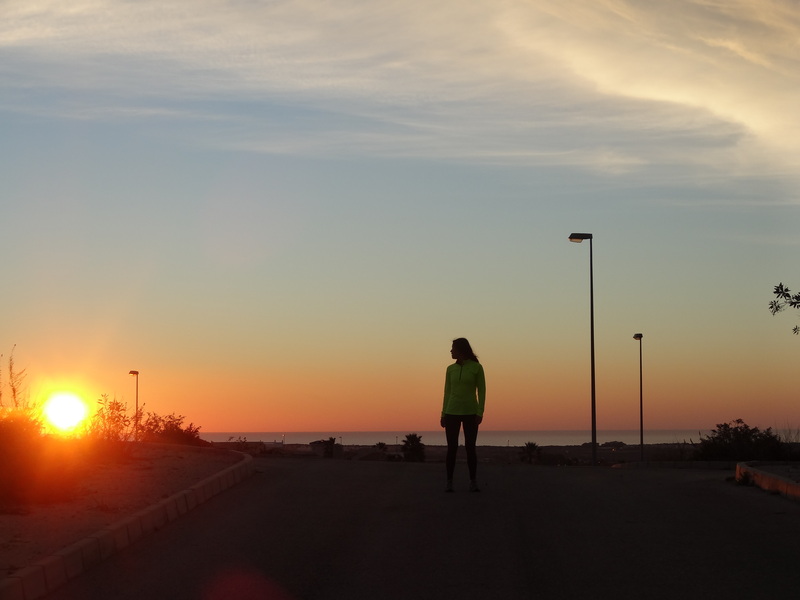 The feeling of getting out in the fresh air and to move your muscles was particularly great this day. We know that we had a 4 hour ride in front of us and we were stopping for lunch halfway, as well as having our raspberry and mint rice cakes along the way. Jason enjoying the last of the sunshine. The first part of the ride was quite flat, but then we got to a long climb, about 7 km long. The rest of the way was downhill and then flat. We were not the only ones thinking the weather was great for cycling, when we stopped for lunch we saw a large group of female cyclists. Nice bendy roads up into the hills. Sofi testing her legs out of the saddle. Back on quiet flat roads along the canal back home. In the evening we went enjoyed the sunset from the roof with a bottle of Cava before going out for dinner at an Italian restaurant. The perfect way to end our week. 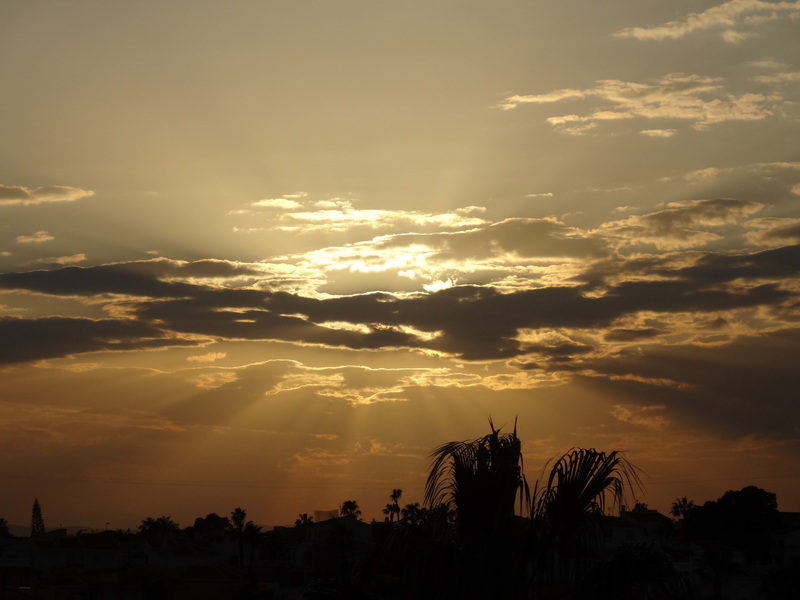 The sun disappearing behind the clouds before finally disappearing behind the horizon. We then had to pack up our bikes and head to the airport. 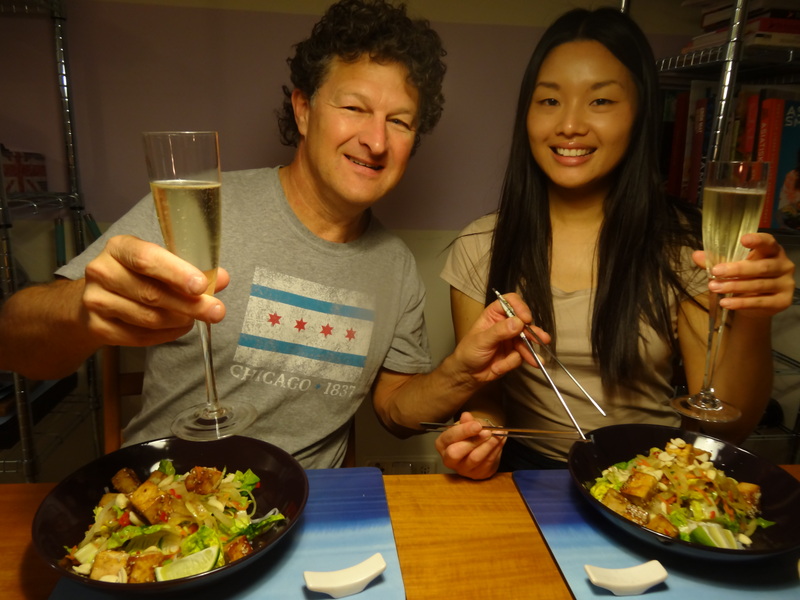 When we came home we were very tired and made a quick dinner before bed. This morning we had a lie in and then we have spent the whole day unpacking our bikes, preparing what to make for dinners next week, doing our weekly shopping, and making bars, granola, and kimchi. We made two different types of bars, both of which will be on the blog tomorrow. 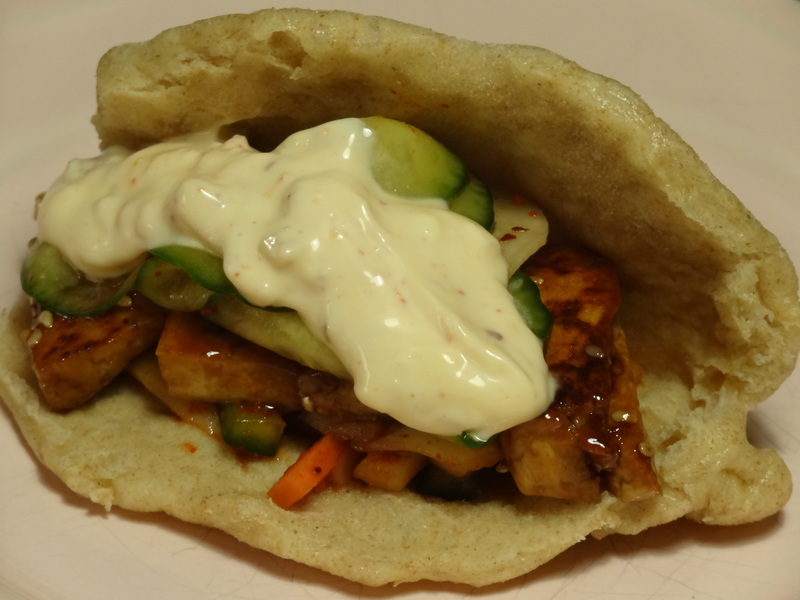 For dinner tonight we made Korean steamed buns with sticky tofu, kimchi mayonnaise, kimchi, and pickled cucumber and radish. 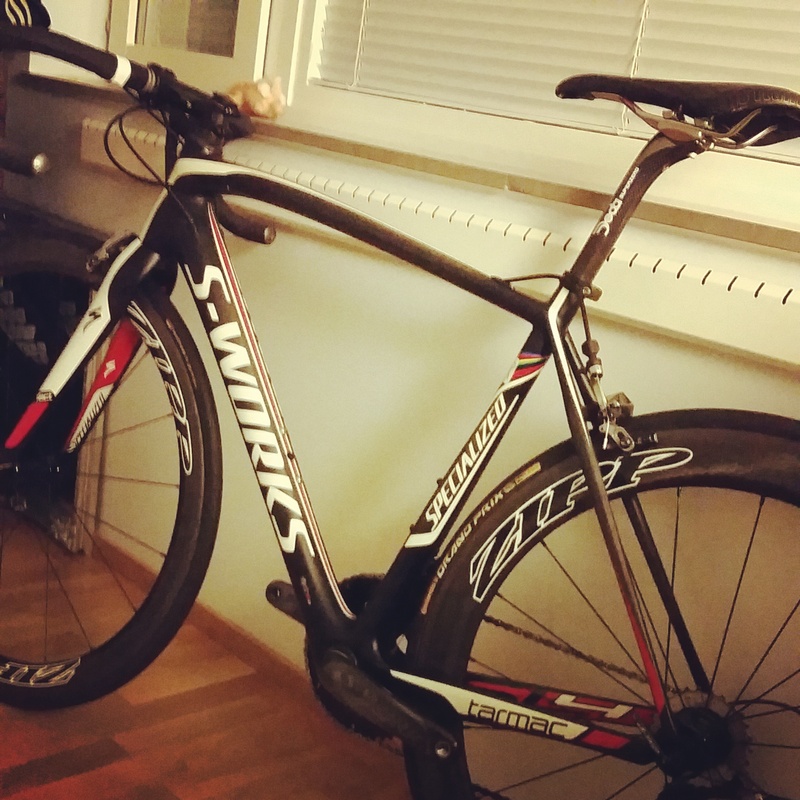 This entry was posted in Thoughts and tagged Blogging, cycling, exercise, homemade, kimchi, Korean, Lifestyle, snack, Spain, tofu, vegan, vegetarian, weekend on 2015-02-15 by activebeans. Last weekend we cooked for some newfound friends. We wanted to make something Asian and something different. 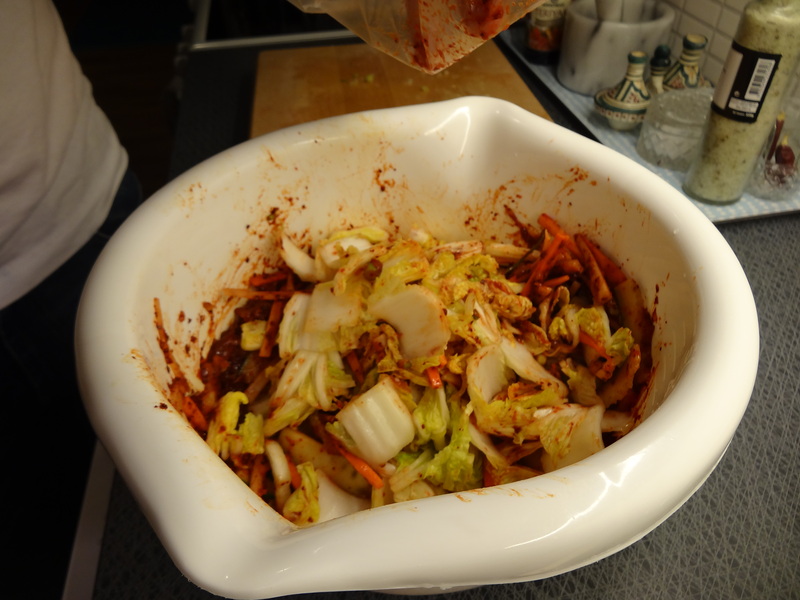 Since we had been making Kimchi a few days earlier we also wanted somthing that we could eat that with. 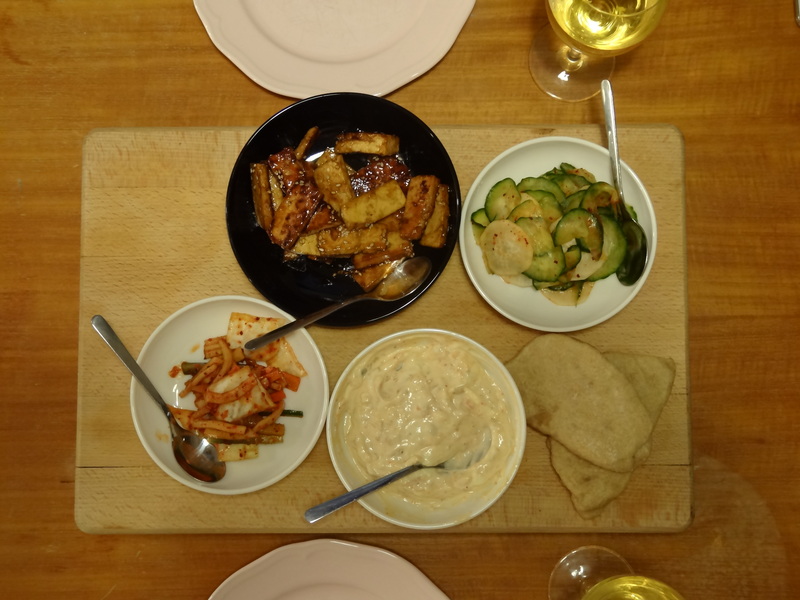 This entry was posted in Dinner and tagged asian, dinner, homemade, kimchi, Korean, spicy, tofu, vegetarian, weekend on 2014-10-26 by activebeans. Kimchi is a Korean fermented side dish. It is made out of different vegetables and various seasonings. 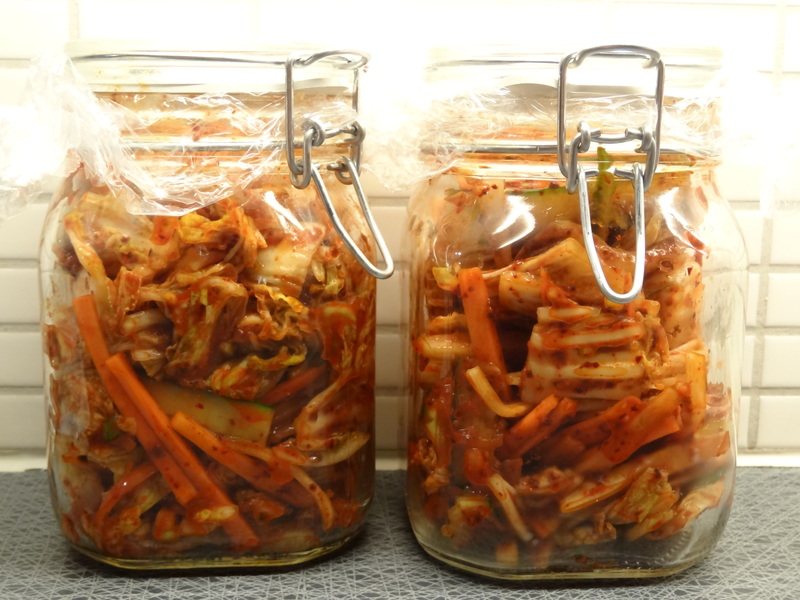 It is traditionally kept in jars to ferment underground for months, but this recipe allows you to eat the kimchi after just 2 days. 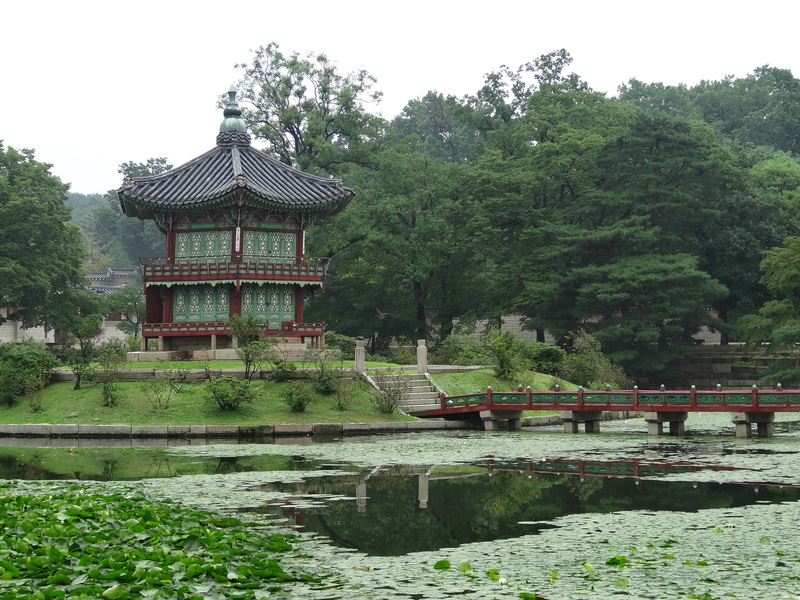 When we went to Korea last year we tried a lot of different kinds of kimchi. 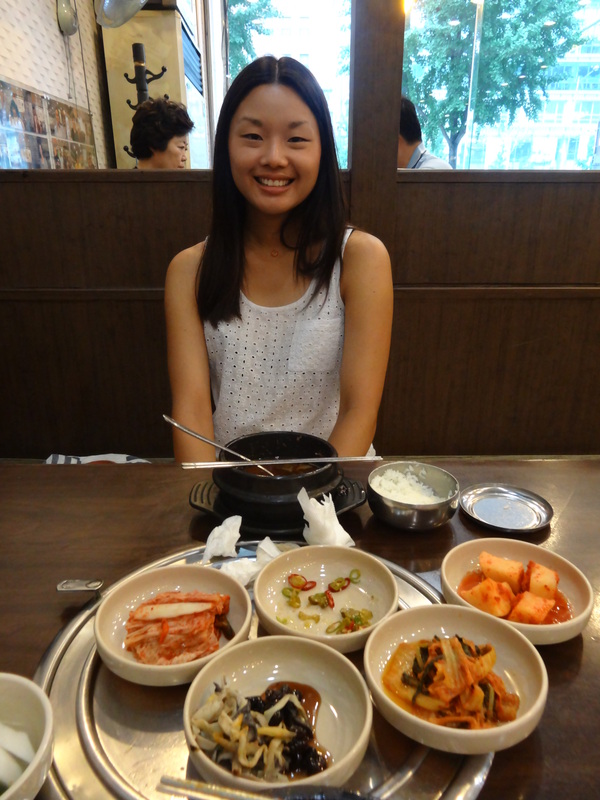 Sofi eating a traditional Korean meal that always includes a few different types of kimchi side dishes. 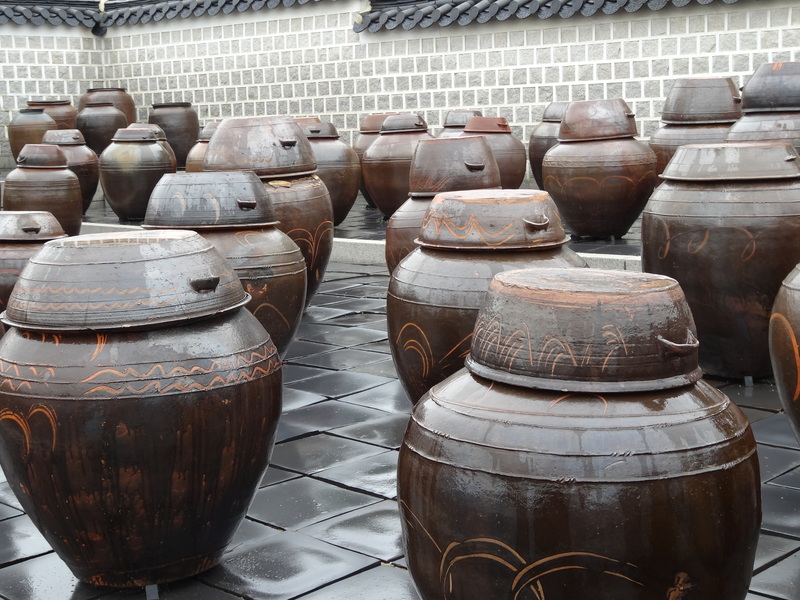 One of the temples we visited had a collection of fermentation jars. 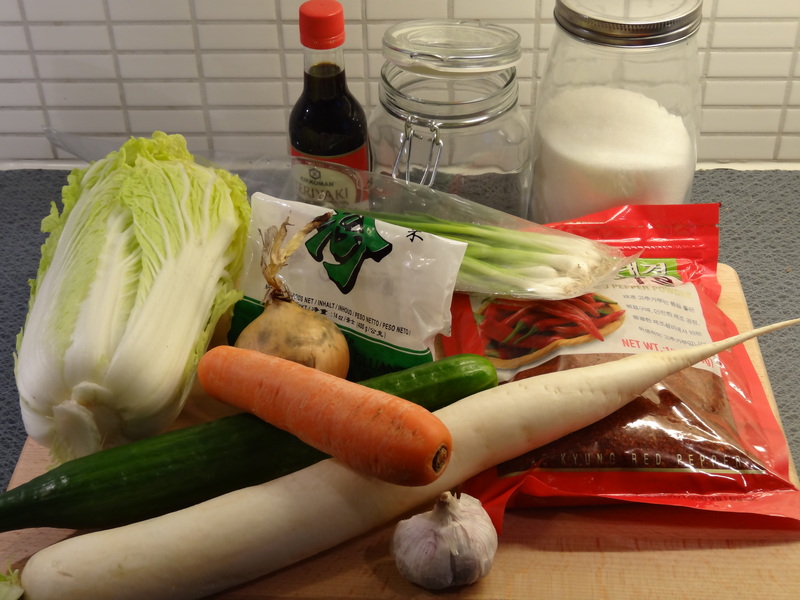 So now we wanted to try to make our own kimchi. 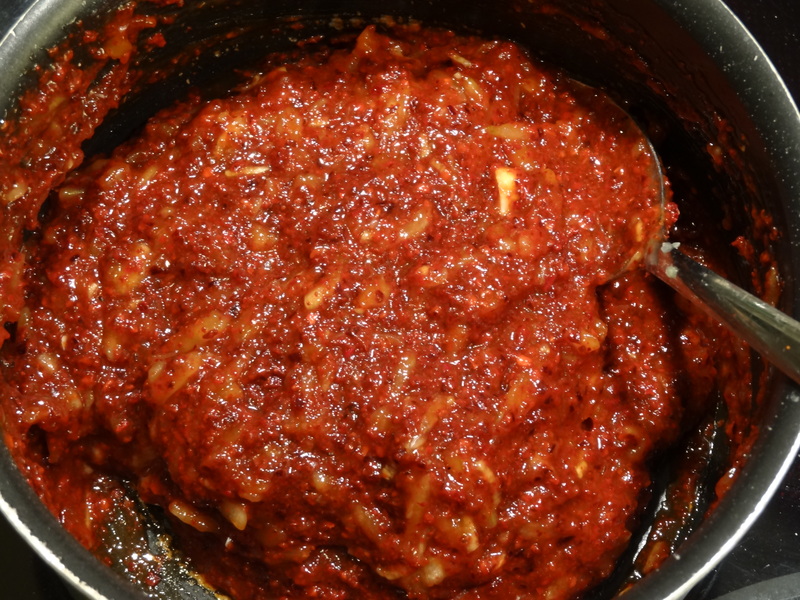 It is really easy to prepare and make, then all you need is to wait for as long as you can before you eat the kimchi to make fermentation process as long as possible. Our recipe is inspired by Jennie Walldén, winner of Sweden’s Masterchef 2013. Chop the cabbage into 4 cm pieces. Put the cabbage in a large bowl and add the salt. Mix thoroughly. Put a heavy weight on top of the cabbage to draw out more water. Let it rest for 1 hr 30 min. Chop the radish, cucumber and carrot into matchstick-size pieces. Chop the spring onions finely. Grate the onion and garlic. 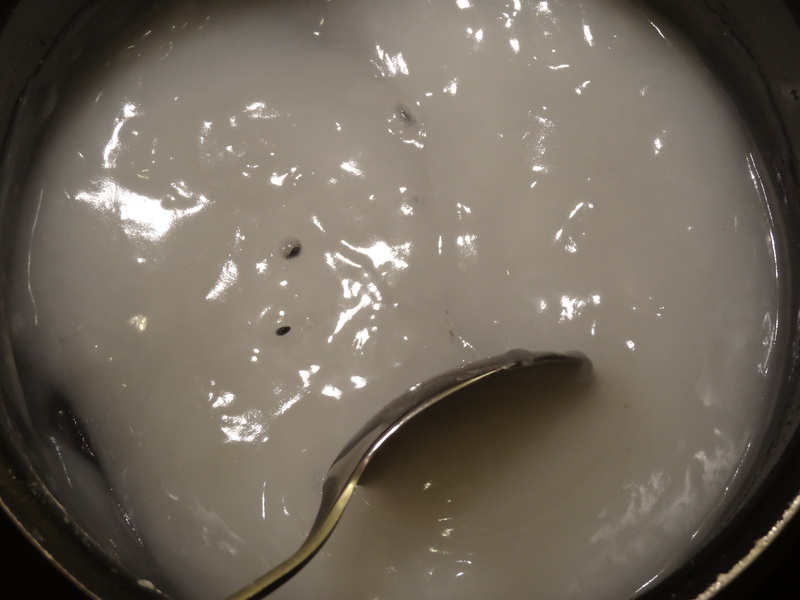 Mix the water, sugar and rice flour together in a saucepan. Boil the mix until it is thick and smooth. Mix in the garlic, onion, teriyaki sauce and gochujaru and stir thoroughly. 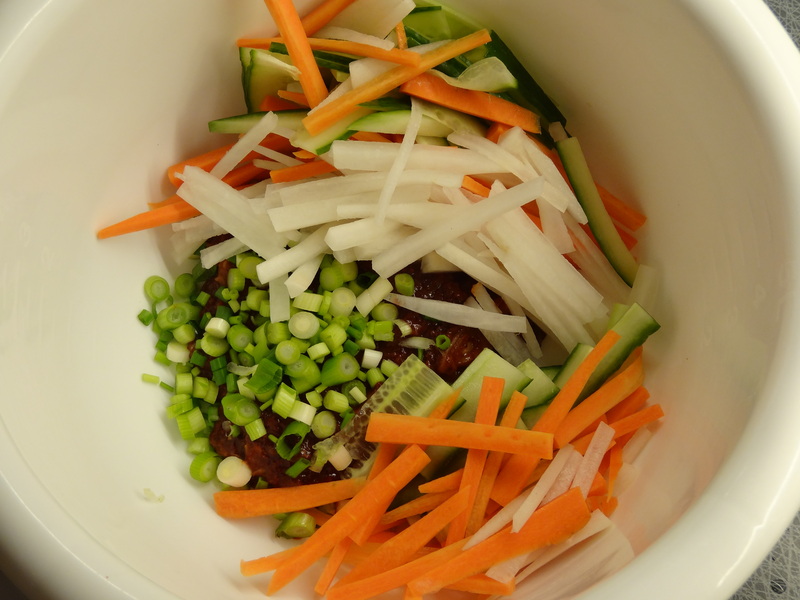 Put the mix in a large bowl and add the carrot, cucumber, spring onions and radish. 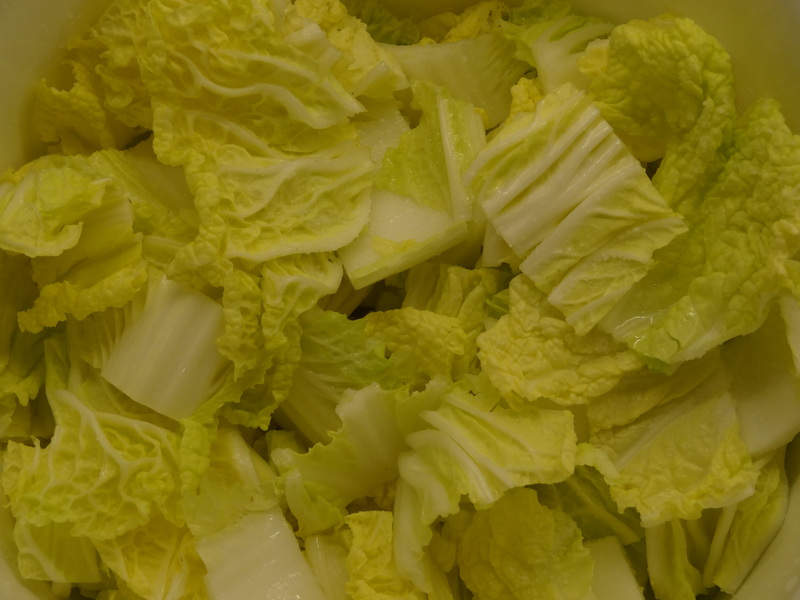 Rinse the cabbage thoroughly in cold water to wash off excess salt. Add the cabbage to the mix. Stir everything together with your hands to keep the vegetables from breaking. Use plastic bags on your hands since the paste is very strong. Put the kimchi in mason jars, Don’t fill them up completely. Leave them at room temperature for at least 48 hours, They can last up to 2 months. 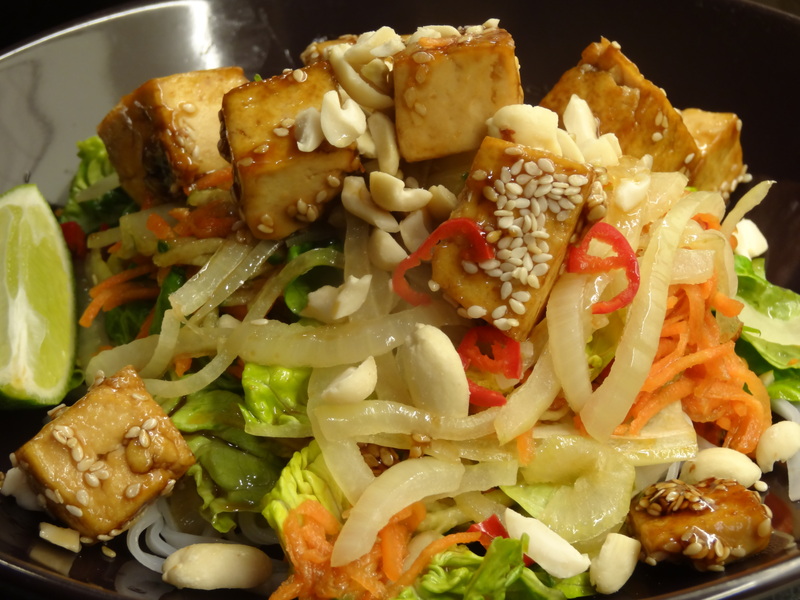 This entry was posted in Snacks and tagged asian, homemade, kimchi, Korea, Korean, spicy, vegan, vegetarian on 2014-10-16 by activebeans.